You’ll find some Westernized Chinese dishes on the menu in China. 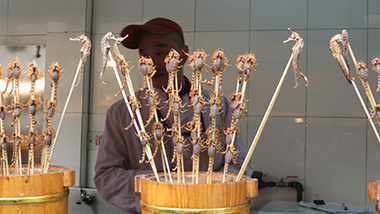 But “When in Rome” as they say… Explore authentic Chinese cuisine and street food like seahorses and scorpions on a stick, or for less adventurous, try the Bing Tanghulu; they’re like mini-candied apples. Ask the locals what’s good. Eating street food is arguably a safer way to ensure you don’t get sick. After all, the food is prepared right in front of your eyes and you can judge the cleanliness of the area. Plus, it’s affordable. You may very well encounter people from the countryside and outside of the big cities, like Beijing and Shanghai, who look at you like Eric Hrubant might look at Madonna should he ever run into her on the street. Be prepared for some staring. People may ask to take pictures with you because you are white, black, tall or have blond hair. They may have never seen anyone who looks like you before. Just act like a celebrity and go with it. The Chinese go-to toast “ganbei” translates to “dry cup.” Business drinking is the norm and many business deals have been made or broken based on one’s ability to keep up. In bars, you may find yourself in a drinking game with the next table. It is very rude to turn down any beverage that is offered to you, even if you’ve already had one or 12 too many. The Chinese expect you to empty your glass and will pour you another to be polite. If you’re not a drinker, make it clear you’re not drinking right from the start. Some have been known to fake a pregnancy or create a prescription that doesn’t mix well with alcohol so as not to offend. Use both hands to give someone something and to take something from someone. Also, present business cards facing toward the person and with both hands on each upper corner. Business cards are also to be received with both hands. It is a slight gesture, but something to remember as the other person will certainly take note. When in doubt, follow the lead of the people around you. If all else fails, humor can go a long way. Dream of traveling through China? CIRE Travel’s agents are world travelers who can plan your trip so it’s everything you could ever imagine. Personal recommendations and tips included.